The Rev. Rob Schenck, of the National Clergy Council, right, and the Rev. 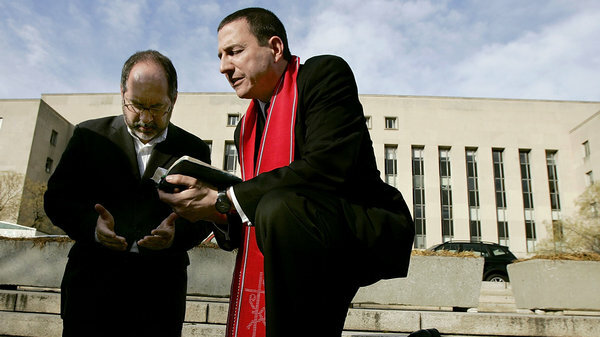 Patrick Mahoney, director of the Christian Defense Coalition, pray in front of the J. Barrett Prettyman Federal Courthouse in Washington, D.C., in 2005. Schenck is a pro-life activist who believes gun ownership and the use of guns is a decision best decided by community leaders, not the government. As the debate over gun ownership and gun control is renewed following the shooting deaths of nine people, including the gunman, at an Oregon community college earlier this month, there&apos;s the voice of an evangelical leader whose views might be different from what some would expect. The Rev. Rob Schenck, president of Faith and Action, is an anti-abortion activist who believes gun ownership and the use of guns is a decision best decided by community leaders, and not the government.
" &apos;I&apos;ll be very candid, I haven&apos;t felt that it&apos;s our issue, until we end up kneeling in prayer, outside the Navy Yard gates in my neighborhood where my apartment building was in lockdown,&apos; he says in the film that will be released on Oct. 30. &apos;So suddenly it goes from theoretical to very realistic.&apos; "
Schenck spoke with NPR&apos;s Scott Simon about his views and how they coalesce with his anti-abortion stance. "When you talk about aiming a weapon at another human being, no matter what the circumstances are, that&apos;s a question of paramount moral and ethical dimensions, so it&apos;s something that we should take very seriously, and I don&apos;t know that a lot of us are," he says. Ultimately, we&apos;ll all make the decision what we will do, whether we&apos;ll own a lethal weapon and use it or not. We&apos;ve had a long discussion in this country — decades-long — on gun control, that is government gun control. For me, this is a question of self-control regardless of what the law may allow me to do. I appeal to a higher law. ... I&apos;ve said publicly, that in our respecting of the Second Amendment, we have to be very careful we don&apos;t break the second commandment, which is the commandment against idolatry. We can set up our own idolatry when we declare ourselves the arbiters of right and wrong, and especially, of the value of a human life. I&apos;ve been a pro-life advocate for 30 years. I see life as having value from the moment of conception, but there&apos;s a whole lot of life after conception. It&apos;s a pro-life question, and it&apos;s a deeply moral question, and it&apos;s, even for me, it&apos;s a theological question. I do not ... on principle; I&apos;ve made the decision not to own a weapon. There&apos;s a lot of reasons for that. One is, I think it does create an ethical crisis for a Christian. Secondly, I don&apos;t necessarily trust myself, and maybe more of us would be better off to question what we will do in the heat of anger, fear, or God forbid, depression. My own family has a history of gun suicide due to depression. I know depression runs in families, and I don&apos;t want to take that risk. I understand that impulse, and I respect it. I don&apos;t impugn people&apos;s motives on that. I think an awful lot of those people are sincere, and that&apos;s a noble inclination that we have. Now whether the handgun — a lethal weapon — is the best way to manage that security for yourself and your family is another question. Sometimes, a handgun can be a shortcut in the equation. Yes, I do. First of all, I don&apos;t want to sound too cynical, but I think politicians are, on the whole, eminently disqualified from really giving us good guidance on this question ... they&apos;re in the business of politics. That means winning elections. They&apos;re going to do what&apos;s in their best electoral interests on the question. I hope that religious leaders are, for the most part, in a pursuit of the truth. So I&apos;ve decided I&apos;m going to shift to where my people are most comfortable, and that&apos;s the law of the heart, and of the mind, and of the conscious. And after that, I think we can probably get to some consensus on policy and legislation.